Anxiety and I are old friends. And I do mean friends, because it has taught me a lot. I’ve used a lot of things over the years to manage it, and ultimately to feel more in control and less afraid. Grades (valedictorian of my graduating high school class), mad organization skills (rigid schedules, list making, some OCD tendencies), exercise (developed an exercise addiction), and, most notably, rigid control of my food. On the outside, all of these things probably appeared really healthy and probably looked like I had my stuff together. However, none of them actually helped, but were ways to transfer my nervous energy into something I felt was productive. In the end, using exercise and food to cope did a number on my body AND mind. We all have a “checker” and it’s a good thing. It allows us to sense danger coming, like when you step out into a street and immediately step back as a car zooms by. For those of us who are overly anxious, our “checker” just seems to be cranked up by a million. We see danger in just about every situation and there is always something to be done or fixed or figured out or solved. I have developed a very keen awareness of what anxiety feels like – in my mind, my emotions and my body. I would recommend working to develop that same awareness to anyone. It is much easier to identify when anxiety starts then to try to dig yourself out of a hole as it snowballs. I have found that it can take minutes to calm yourself down or it can take days or weeks or months. I’ve been conducting Operation Peace for a while now. There are days I still struggle to a certain extent, but it is nowhere near as bad as it once was. I attribute this to a number of things, and I would like to list them here for those of you who may find it helpful. Starting each day with prayer and scripture study. Some of you might call this a devotional or meditation or just quiet time to yourself. Either way, this has been by far the most effective coping strategy for me. It connects me to what I value most and brings me the most peace. I believe we are all divine and connected and that we have a Father in Heaven that is intimately involved in our lives. He loves us and wants to help us, but also allows us to struggle so we may learn from our own experiences. I know we will return to live with Him someday and because He wants that for me, He will provide daily guidance, direction, love, peace and miracles. I have experienced all of those and starting my day this way reminds me to hang on to hope above ALL else. A close second to the first, I have also experienced life-changing benefits from implementing mindfulness skills and tools. Mindfulness is defined as: “a mental state achieved by focusing one’s awareness on the present moment, while calmly acknowledging and accepting one’s feelings, thoughts, and bodily sensations, used as a therapeutic technique.” Essentially, I have learned how to discern the difference between irrational fears and truth. Practicing mindfulness has allowed me to live more in the present – focusing on what is right in front of me – rather than feeling anxious about the future or some sort of impending doom. 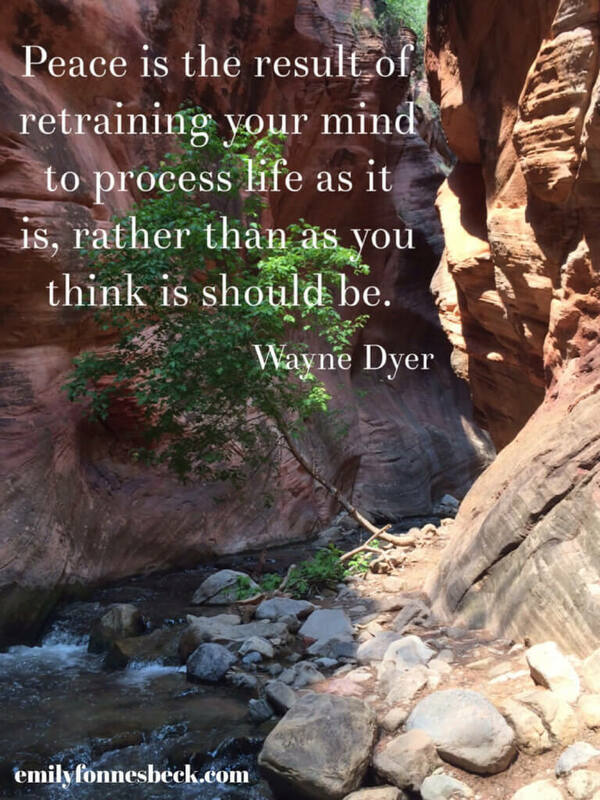 When I feel my mind start to race, I take deep breaths, validate my thoughts, feelings and worries and then redirect my thoughts to what is right in front of me and remind myself to make decisions based on what IS rather than what I am anticipating. It’s gotten easier and easier to do as I have practiced. It has taken a lot of work but at this point, it feels unnatural to overthink or overanalyze . I could have never said that without learning and applying mindfulness principles. Journaling. Selfishly, this is why I blog so much! Anything I have written has likely benefited me more than you. Obviously I also journal privately, and I would encourage you to do the same. Do not underestimate the effectiveness of this activity – I am sure you will come to understand your own thoughts, feelings and situations more clearly, making them feel more manageable. In my case, it’s been essential to work on body image and food issues. Most notably, I’ve had to challenge extreme food anxiety and an exercise addiction by eating fear foods and not exercising. This is where my mental illness may differ from yours, but if you find similarities, I strongly encourage you to seek professional help. I could have never gotten to this point without the help of a treatment team. It’s also why you couldn’t pay me to ever go back to worrying about what I am eating or how to manipulate my body shape. Knowing my tendency toward anxiety, it would be very irresponsible to ever engage in those behaviors again in any degree. If your struggle has been similar to mine, I encourage you to develop a firm resolve to give up dieting or body manipulation forever. Instead, adopt the mindset of self-care and how you can use food and exercise to support and enhance your health and well-being. Living mindfully has helped me make food and exercise decisions based on how I feel NOW rather than what happened yesterday or what might happen tomorrow. By doing so I have come to know that ice cream (or any other food) absolutely CAN be the healthiest choice. Even if your struggle isn’t similar to mine, a critical mindset about food and your body will only increase your propensity toward anxiety, depressive symptoms or other emotional distress. If you think that weight loss or finding the perfect diet will alleviate those issues, it’s very, very unlikely. We can handle only so much in a day, and weight and food issues tend to feel all consuming (and weight/food obsession can and will happen at ANY weight), which could lead you to have less emotional resilience to other and more important issues. Anyone will feel better mentally and physically if they focus less on weight and diets and more on how to support their overall well-being. As mentioned, I’ve worked with a therapist, where we identified the very root cause of my suffering. It’s very much linked to my overwhelming need to do everything perfectly, and I’m sure you can imagine (or have experienced) the kind of anxiety that would result (since it is, in fact, impossible). I can attest to the greater confidence and peace that has come as I have practiced being more kind to myself and others. Cutting myself some slack, bailing on my to-do list for something more meaningful, not comparing myself to others, avoiding assumptions and judgments, not taking offense (even when intended), and ultimately, not eating or exercising by any rules. My recommendation to you would be to practice more self-compassion if you struggle with any sort of mental illness. I share because some of you might find truth in what I say, and healing can happen for you as it has for me. I do believe that none of us experience things for only our benefit and learning, but to take what we learn and share it with others. None of us own the truth, it all comes from the same place and it’s given when we are willing to use it for the benefit of others. So if that’s you, I sincerely hope it helps. Wow— this was so helpful. Thank you.